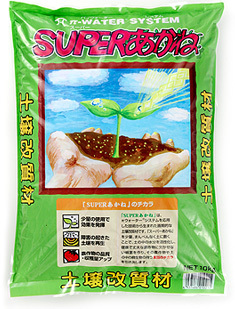 Soil conditioner "Super AKANE" : Agricultural materials | IBE TECHNO CO.,LTD. Soil conditioner made of natural materials for paddy fields, farms, house farming, and kitchen gardening. It is nontoxic and harmless to humans and animals. It promotes formation of humus and forms fine structure of soil with good keeping water, draining water, and fine ventilation. Troubles in continuous cropping and harmful insects will be reduced and the use of this material will help the lower or non chemical cultivation. The crops from the fields applied this products have been highly evaluated for their good original tastes. It helps to raise the beautiful greens on the earth and bring rich harvest in the fields. Let's get back the energy of the earth for our children! ※"Super AKANE" is not a fertilizer. Please use fertilizers. · User's story 1 : Soil conditioner "Super AKANE"